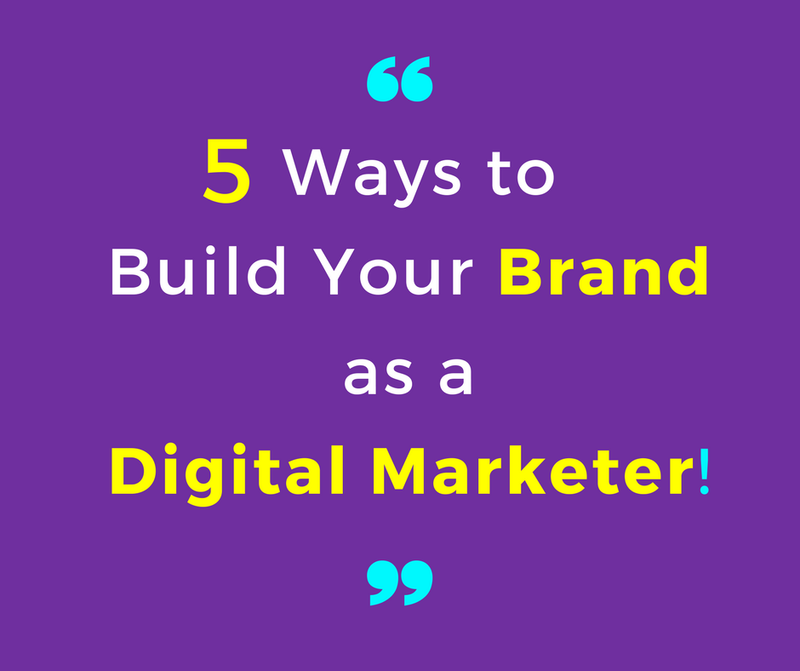 NK the Marketer: 5 Ways to Build Your Brand as a Digital Marketer! "It’s important to build a personal brand because it’s the only thing you’re going to have. Your reputation online, and in the new business world is pretty much the game, so you’ve got to be a good person. You can’t hide anything, and more importantly, you’ve got to be out there at some level." If you are lucky enough to be one of the people who was able to dive into digital marketing at any point in its infancy, you are a pro, and no one doubts your abilities! If you are an awkwardly old millennial like me or younger, it may be harder to prove your worth as a digital marketer. Even though we are called digital natives because we grow up with so much of the technology that is used in marketing today, we may lack a thorough understanding of how to use for example Facebook or Twitter for business. Even if we do know how to use some of these tools and platforms in a business capacity, we fall short in producing concrete portfolio examples. So how do you go about proving that you can be a great asset in this discipline? In the past two years, I have had the opportunity to try a few different things and would like to share my top 5 tips for building your brand as a digital marketer. 1. Have an up-to-date resume, LinkedIn profile, and business cards! If you are doing great work at school, a part-time job or through volunteering and you have not updated your resume or LinkedIn profile, you are missing out on opportunities to highlight and showcase your work and learning experience. Be sure to continuously update your capabilities and skills as you gain them. Your resume should be concise but detailed enough to stimulate enough excitement in an employer to get you an interview. LinkedIn is a platform to fill in more detail about your work experience or upload portfolio examples. A well worded and crafted LinkedIn profile can have recruiters coming to you, instead of you having to chase them. Business cards are essential in networking, can be an excellent way to make a lasting impression of people you meet at events. You can be creative and showcase some of your skills like photography or design. Be sure to include contact information, websites, blogs and portfolio links. Networking is a hard one for anybody, especially those who get drained by being social. It is, however, an important part of building your brand. It gives you a chance to meet people in your field or industry, learn about new and current trends, and allows you to find and connect with people who could be great mentors or career guides. Some easy ways to network are joining a professional association or volunteering with one. Most association meetings and events have networking time before and after events to allow for mixing and mingling. This is an excellent time to meet people you have not meet before and strike up a conversation. If you a stumped for what to talk about, try asking why they find the topic interesting or relevant. Another technique to use to build your network is “cold-calling” people on LinkedIn. Research and determine a role or two you would like to pursue in the next 5-10 years. Look for people on LinkedIn, who have that role, and reach out to them. I have found that you can identify a commonality like having the same alma mater, coming from the same state or town or having common interests with said person can be an excellent way to connect and break the ice. Many of my LinkedIn connections acquired in this manner have led to friendships, mentorships, and interviews. Mentors are a great resource for building your brand as a digital marketer. You can learn from their experience in the industry, run your resume, LinkedIn profile or any other questions by them. When talking to one of my mentors once, I mentioned I wanted to learn how to blog and create content, and she suggested starting my blog, and here we are. Another mentor was a great resource for figuring out some of the things I was doing wrong in my job search process and gave me advice and little things I could change to make the process go smoother. Mentors are typically further along in their career and are very willing to share their knowledge with you. Don’t shy! Reach out to someone you admire and ask them if they would not mind telling you about their career journey and advice for an up-and-comer! Internships and coursework can be great ways to build your portfolio and showcase the professional and learning experience. When choosing classes or courses at school, be mindful of whether the class has a real-life client and if you will be able to use the resulting work in a portfolio or as a case study. Be sure to consider the various fields of marketing in which you want to gain experience. You can also look for freelance work with family and friends or volunteer your time and talents with your favorite non-profit. Help them create flyers for an event, market an event on social media, create an editorial calendar, etc. These may seem like minute things, but a non-profit or a family business with a small budget would benefit greatly from this, and you get portfolio material. You can also build a website that serves as a resume or start a blog on a topic you are passionate about. Projects like this give you hands-on experience with platforms and tools that may be valuable for an internship or job. The fact that you have taken the initiative to teach yourself something will also win you points with potential employers. 5. Take Online Courses for Skills You Lack. If there are specific fields of digital marketing, you would like to work in but have not had the opportunity to build the required work experience, take an online course and get certified. If you are interested in Social Media Marketing, Analytics or Paid Search, you should make it a point to study and take some free or low-priced certifications and courses to help show proficiency. Many courses will give you a certification you can post on your LinkedIn profile or even concrete case studies and tools to use during interviews. This article is to highlight some of the methods I used to build and grow my brand. It is not all encompassing list. What are some other ways you are building your brands? Please share in the comments below. If you would like to ask me any questions, please comment below or email me at nanak@nkthemarketer.com.